You are at:Home»Herbs»Quercus infectoria Oliv. Latin name : Quercus infectoria Oliv. Description : Majuphal alone or in combination with other herbs is a promising remedy for dental troubles. Powerful astringent and styptic. Useful in leucorrhoea and other vaginal discharges and in profuse menstruation. Also useful in diarrhoea, dysentery, gleet and long standing gonorrhoea. It is also used as a gargle to treat sore throats, stomatitis and tonsillitis. Majuphal is used as a hair dye. Since Majuphal is an astringent and wound healing, it stops bleeding from wounds. Majuphal is used for gargling in pharyngitis and stomatitis. Majuphal’s powder is used for application in rectal prolapsed, piles and wound. Majuphal powder is also applied in excessive sweating. Majuphal powder is used in leucorrhoea as vaginal suppository. Majuphal is a strong stool binder; so it is useful in diarrhea, dysentery, bleeding piles, bleeding diathesis, cough, polyuria, diabetes, pyuria and leucorrhoea. Recommended Dosage : 3 to 5 g powder of dried galls. 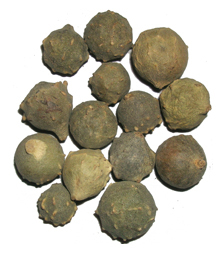 Contraindication : Internal use of the galls may reduce or inhibit the absorption of alkaloids and other alkaline drugs.